... just had a really nice flashback reading through this topic again, whats the most craziest is that its 14 months ago now!!!! Damn! It reminds me I still own you a burger! funny. just talked with superully and chrischris about this story a few hours ago. ChrisChris, check this out : KIDDY RIDES HELICO. For parts maybe? Auction ended with no seller...but maybe still available? Need again more of these! How do you start on something like this? Are there tips or tricks to find something like this. As a good start you get a pair of boots, a helmet, a sword and a lucky charm. WOW. Amazing trip. Amazing condition of the cabs in such a piece of junk. No more tag / new paint!? New plan in progress for the ship? I saw the post on UKVaC too, and checked the video out - looks really nice, but imagine they will refurbish the ship that would take a lot of time, and the cost will be huge!! ...and the ship is back to life! - 2.5 Hours (approx) of award winning immersive entertainment. - Upon survival photos with cast and crew! 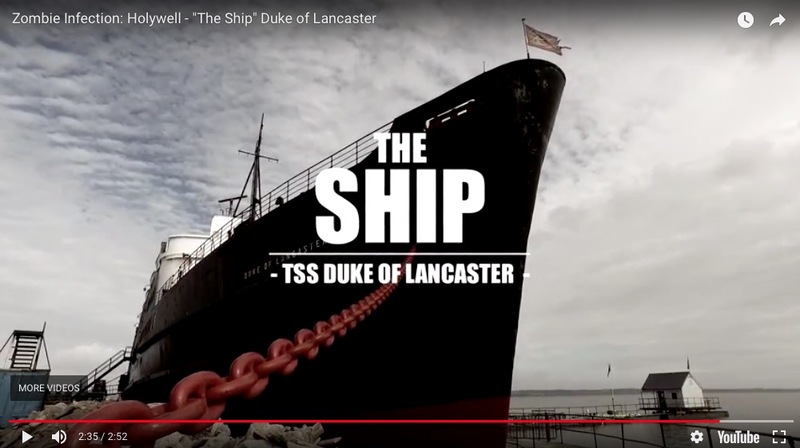 The 4,450 GT TSS Duke of Lancaster awaits you and your team of undead explorers. The ship is full of infected, untouched for years, they'll be strong and hungry... Intel suggests that this location could be the hub of recent rebel activity in the unquarantine zones. You'll need to learn quick, gain access and explore deck by deck to uncover the answers Harvertech are looking for. This one isn't for the fainthearted." Can you believe your eyes!? Exclusive to Zombie Infection comes a once in a life time opportunity to immersive yourself in our zombie universe on this incredible turbine steam ship. Believe us when we tell you that this is not only an incredible place to visit, but also that it is the ultimate zombie experience location. Multiple decks, rooms, cabins that are locked in time and completely unexplored. All of this mixed with hours of immersive entertainment being chased, challenged and instructed by our award winning cast means you'll need to grab your tickets fast and join a VIP selection of Zombie Infection patrons who have had the chance to step on board!